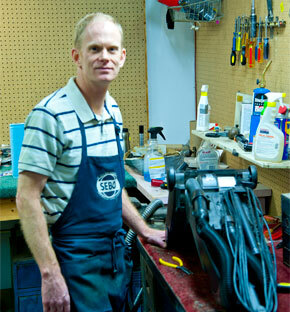 Vacuum Store owner Jim MacDougall has over 22 years experience selling and servicing vacuums. MacDougall has owned The Vacuum Store since 2000. Jim, who grew up in Dearborn, Michigan started in the vacuum business at the age of 18 at Dearborn Vacuum. Jim then went on to earn an associates degree in electrical/electronics at Henry Ford College, and a BS in Biology from Northern Michigan University. After college Jim came back to the vacuum business working at Bank’s Vacuum in both Grosse Point and Dearborn. In 2000 Jim moved to Ann Arbor, purchased The Vacuum Store from the previous owner and became a local Ann Arbor entrepreneur. In October of 2008 Jim relocated The Vacuum Store to a newer and bigger store front on Jackson Road (3929). Jim is involved in the Ann Arbor and Washtenaw County community supporting Chelsea High School Hockey and a local church choir. When he’s not repairing vacuums Jim enjoys fishing with his dad and brother in Florida, Canoeing on the Huron River with friends, reading paperback novels and watching movies. Jim is proud of The Vacuum Store, which has always been known for its great service and huge selection of bags, filters and belts for all makes and models of vacuums. The Vacuum Store staff is incredibly knowledgeable about all things “vacuum” and can help you choose the best vacuum for your needs. The Vacuum Store is also unique in that it lets you try the vacuum right in the store to see how it works. “Try Before You Buy” is a real advantage for anyone shopping for vacuums. The Vacuum Store is clean and well-stocked with vacuums and vacuum supplies for every buyer. The Vacuum Store carries the following brands: Sebo, Dyson, Hoover, Eureka, Sanitaire, Cirrus, Panasonic, Carpet Pro, Bissell and rebuilt Kirby vacuums.